Atop D.C.'s buildings and in its backyards, a dedicated group of beekeepers ply their trade. Their work benefits everyone who enjoys the District's flowers, trees, lush landscape and unique honey. WASHINGTON — The District provides plenty of good street-level sights. There are attention-grabbing monuments, fountains, and displays in store windows. Both locals and tourists alike, however, may not know there is a thriving rooftop community in the District, and no, we’re not just talking swimming pools and patios. Take, for example, a two-block stretch of 24th Street Northwest, between M and N streets. At ground level, you have the Fairmont Hotel; next door, the headquarters of the World Wildlife Fund. If you’re lucky, you might walk past the hotel and bump into a visiting celebrity. Earlier this summer, rumor had it the cast and crew of the “Wonder Woman” sequel were there. Next door, Barack Obama rents office space in the World Wildlife Fund building. But for those in the know, the buzz at these places comes from the rooftops, where thousands of honeybees live in their hives. The Fairmont has two hives, and perhaps more one day. The World Wildlife Fund has a green roof, home to a carpet of local plants and grasses, along with its own bee colony. Those are just four of the more than 400 hives thriving in D.C. Across town, the Sofitel has a beehive, too. Maryland and Virginia host hundreds more urban and suburban bee colonies just across the District line. District residents interested in keeping hives must register with the Department of Energy and Environment, obtain a permit and follow other requirements posted at the department’s website. The existence of these hidden beehives isn’t just a way for a business to trumpet its sustainable practices on a restaurant menu. The urban hives are increasingly important because bees have been struggling. A study by the Virginia Department of Agriculture and Consumer Services released in late June found that nearly 60 percent of honeybee colonies in the state were lost over the 2017-18 winter. That was due to high levels of Varroa mites and nosema infections within the hives. The national average was closer to 30 percent. Colony collapse disorder, which received worldwide attention about a decade ago, continues to be a concern, but efforts to make commercial agriculture more hospitable to bees and other pollinators are gaining traction. In the District, for example, the lush gardens at Hillwood Estate, next to Rock Creek Park in Northwest, are becoming more friendly to bees, butterflies and other insects that act as pollinators. Virginia is working to increase the number of healthy bees by encouraging people to investigate beekeeping as a hobby, having recently received an overwhelming response to a pilot beehive distribution program launched in early July. Tignor said 80 crops in Virginia alone require insect pollination in order to produce fruits and vegetables. Additionally, the state’s remarkable forests, meadows and wetlands are directly connected to the health of its pollinators. “They give us the beauty we are so enriched with,” he said. The D.C. region’s bees produce a unique, sought-after honey, whose flavor comes from trees such as the tulip poplar and the basswood. Much of the honey from other parts of the country is influenced by flowers instead of trees. Beekeepers keep the insects in rectangular, multi-level boxes, with screens upon which the bees create wax and honeycomb. The bees turn these boxes into hives, and just as your own home has different rooms for different purposes, the different levels of the hives host brood, or developing honeybees, pollen, wax, and most importantly, the honey. Beekeepers harvest the extra honey and use it in cooking, mixing drinks, as a homeopathic allergy remedy and sometimes as a gift for neighbors who accept that thousands of bees may live next door. While the poet Robert Frost wrote “good fences make good neighbors,” it also turns out that good neighbors, who allow the folks on the other side of the fence to keep bees, can do a lot for the local ecosystem. Pollinators, such as bees, dragonflies, butterflies, ants and moths help keep flowers in bloom and fruit on local trees. The greater the number of hives in the region, the better chance that local farmers and community gardeners will have a bountiful harvest. Burnham said that people who are interested in getting into backyard or rooftop beekeeping would be smart to get to know their neighbors sooner rather than later. In some areas, it can take up to a year to qualify for a hive, so if you’re looking to raise bees in the future, its best to make friends today. “It depends on how good of a neighbor you have been so far, whether or not your neighbors trust you,” Burnham said during an event at the Fairmont Hotel in late June, where she showed a cluster of reporters the hotel’s rooftop hives. Kevin Platte is a mentor to the employees at the hotel who take care of its hives. The Fairmont harvests honey and uses it to flavor certain items on the menu of the in-house restaurant, Juniper, and to provide a little sweetness to a special “bee-tini” featured at the lobby bar. Platte recommends for aspiring beekeepers to plan ahead. In D.C., beekeepers need to take an eight-week basic beekeeper course offered on Saturday mornings during the winter. Then, future beekeepers need to put in some time under a mentor to find out if they really have an affinity for dealing with bees. After all, most beekeepers say the true pleasure in the hobby comes from interacting with the hive and getting to know the bees. Extracting honey right from your own backyard is really just a perk for all the time and effort spent making sure the bees are happy and healthy. 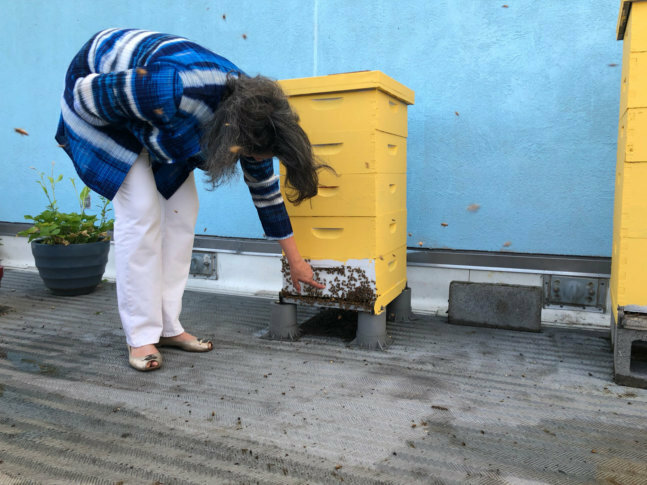 If you’re not yet ready to commit to a winter-long training program, the Fairmont has a sweet taste of what it might be like to be responsible for a colony of bees via its “Bee a Beekeeper” package, which includes a tour of the hotel’s rooftop, two hours with a member of the D.C. Beekeepers Alliance, a membership to the group, a gift certificate for beekeeping supplies, admission to the gardens at Mount Vernon, and the chance to taste items prepared using the hotel’s honey. A weekend escape offers prospective beekeepers up-close exposure to bees, which could be useful for those worried about being stung. Platte said all beekeepers get stung, but once they get used to it, it’s more of a nuisance than a crisis. That’s why working as an apprentice is important early on, before you commit hundreds of dollars to buy bees and supplies. It’s also important, the beekeepers said, to understand that when you take on a hive, you’re taking responsibility for thousands of living insects. John Ferree is the apiarist for the colonies at Mount Vernon and the Kennedy Center. He said he keeps coming back to the bees because they’re “fascinating.” Initially he was scared, even though he, his father and his grandfather worked with bees when he was a boy.